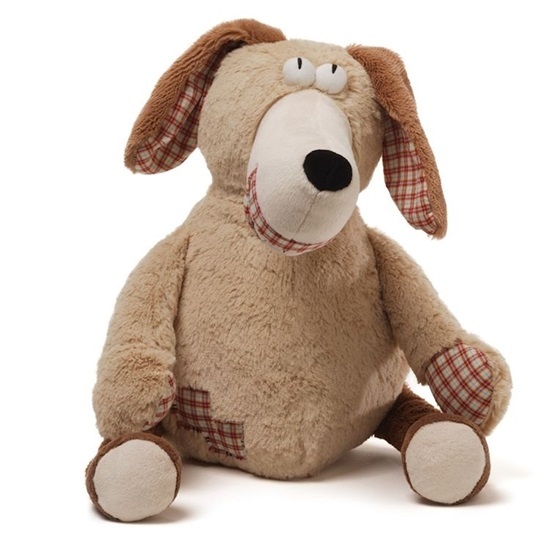 Meet "Normy" a floppy, soft, huggable dog that needs a new home! With his funny, whimsical personality, "Normy" is sure to steal your heart! This is a 16-inch tan plush dog, with dark brown plush ears that are lined on the inside with multicolored gingham fabric. His floppy legs are a dark brown plush with white plush on the bottoms. His paws also have a gingham lining on the bottom. He has a long white snout, with gingham lining on his mouth, the lining moves to reveal silly pink gums and teeth! He has white sewn on pillow eyes and a soft, black nose, perfect for kissing! He also has a dark brown soft plush floppy tail.